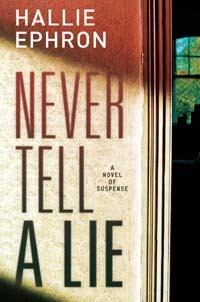 HALLIE: At last, "Never Tell a Lie" is published. I labored over that sucker for nearly three years, so now when people tell me "I couldn't put it down! I finished it in three hours!!" I have distinctly mixed feelings. The idea for the book came to me, innocuously enough, at a yard sale. Just like the yard sale that opens the novel, it was at a big Victorian house around the corner from me. New owners had painted the outside mauve and purple. I was dying to know what they'd done to the interior, so I peppered the poor woman throwing the yard sale with a million questions. Finally, probably as much to get rid of me as anything else, she said, "Would you like to go inside and look around?" She pointed the side door. "Let yourself in." I did. Inside, there was a brand new kitchen. Upstairs, the bedrooms were straight out of House Beautiful. As I started up to the third floor, the mystery writer in me kicked in and I thought: What if a woman goes to a yard sale and somehow she manages to talk her way into the house? She goes inside. . . and she never comes out. Thoroughly spooked, I bolted down three flights and out the door. Have you ever been spooked by a thought that turned an everyday situation sinister? HANK: OH. Constantly. Daily. It's a sickness. Even that, you know? I'll cough, and then think--what if this is the beginnning of the plague, and I have it and... And suddenly, I'm in The Stand. Jonathan goes out to get the paper. It's just at the end of the driveway. "Be careful!" I always tell him. "Of WHAT?" he says. It's potentially dangerous, in my mind. In his, it isn't. What if the people handing out free food samples at the mall are really terrorists, and the food is poisoned? (Actually, I may use that in a book so forget you read it.) And I completely got PTSD after seeing the movie "The Dark Knight." I was clutching Jonathan all the way to the car, terrifed someone/something was going to leap out of the darkness. I may have seen too much TV news. HALLIE: LOL. That's gotta be it. Not sure why but that reminds me of once when I was walking with my daughter and we were playing "what's that thing" (pick up a small scrap of trash from the street and try to guess what it was part of)...and I picked up a red plastic tab that said "DO NOT REMOVE." Where's CSI when you need 'em. HANK: I still have a little red ticket from a sweepstakes drawing that says "Keep this ticket." So hey, I kept it. Because what terrible thing might happen if I don't? RHYS: Congrats on the new book, Hallie. As you say, this is one of the pitfalls of being a mystery writer. The brain switches so easily to "what if?" And we have trained ourselves to act on that what if. A snippet of overheard conversation becomes sinister, a stranger lurking on the corner becomes a potential ax murderer... And I've always been afraid of the dark. I grew up in a big spooky house that I was sure was haunted. The wind used to make the rug outside my bedroom door flap up and down and sometimes windows opened on their own. When I talked about this to my brother, years later, he replied, "of course it was haunted." So I'd never go up three flights of stairs in a purple-painted house. RO: Oooh, as a diehard yard sale fan, I'll never be able to go to one again and walk up those stairs to where I've been assured "the good stuff" is. Even if the house isn't purple. That's my idea of something really scary, the everyday thing that turns into a nightmare. I mean, who's going to be fooled by a drooling 7-ft stranger with tattoos and an eyepatch? Just run...no story. My sort-of-scary moments occur whenever I'm on a driving trip and I have to use the facilities - or buy a can of diet red bull- at a gas station. It's not the toilet that scares me (Dr. Roberta...you hear that? )Ever see The Vanishing or Breakdown? Yikes. It crosses my mind every time I stop in one of those remote service stations. HANK: Oh. The Vanishing (the Dutch one) is the scariest movie I've ever seen. Ever. I almost wish I hadn't see it. ROBERTA: Ro, I'm not worried about the toilet, I'm worried about the diet Red Bull! :) Hallie, big congratulations! So excited to see your book on the shelves! And what I've learned from the tag sale story is to never, ever, let a stranger into the house, even if she SEEMS like a nice, nosy middle-aged lady. Maybe especially that. I too see danger and plot twists everywhere. It's kind of exhausting, isn't it? HALLIE: What about never ever GO INTO a house, no matter how hunky the man is who invites you in to "have a look around." JAN: Wow, was it really three years, Hallie? It seemed like that book flew off your computer!! Congratulations on its release and the many terrific reviews. When I was still dealing with my plane phobia (now conquered!!) I once had a cognitive behavioral therapist tell me that my problem was I had too much imagination and I applied it to EVERYTHING. That probably applies to all of us! For me, it really was the toilet.... but not the germs. It all started as a small child, when I convinced myself there was a monster in it. I used to open the door, flush the toilet and run like hell. Sometimes when I go to lock the garage door at night, I'll let in the thought... what if someone was in the garage just waiting.... and I get that full body fear thrill people go to the movies for. But I've spent a lot of energy trying to NOT let those thoughts in my head, and I think it's net gain. HALLIE: My daughter used to be afraid of squirrels, so I'd send her out with a can of Lysol (AKA magic squirrel repellant) to protect her on her Hot Wheels. Please join the conversation. We're dying to know. Public toilets--yes, that pushes a button. Camille Minichino once wrote a scene in which the protag is trapped in a public toilet and hears the click of a gun...now I always check if I could escape under the side, through a window etc. And once I was trapped in a toilet at a national park in Australia by a very large huntsman spider sitting on top of the door! Trapped by a spider. Now that is SCARY. I can absolutely imagine that. Rhys? What did you do? Hey Gay! Great to see you! My own naivete can scare the c@%&! out of me. I've improved over the years, but I've been known to get into a situation and realize what a totally stupid move I'd made. You know those horror movies where the woman hears the strange noise and goes to investigate, and the audience know's it's going to be bad and is saying "Don't open that door!!" Well, that's me...I just gotta know what made that noise. No monsters in the house (my husband has his own set), but Ro's comment reminded me of a trip we took to see my sister, who lives in Kentucky. We were driving back, through a part that is definitely NOT Lexington horse country, and stopped at a tiny roadside gas station/convenience store, to get something to eat. The place was everyone's worst nightmare of rural Appalachia--nothing but pick-up trucks filled with old lumber (yes, with gun racks) and local guys in plaid and greasy baseball caps. I was afraid to open my mouth to order a sandwich for lunch, because I thought they'd decide I was a damn Yankee and I'd never be seen again. CONGRATULATIONS HALLIE. I am excited to read NEVER TELL A LIE and intend to savor it over Orange Dulce hot tea and several pieces of Neuhaus chocolate. Out on a neighborhood walk a few years back, I had a guy pull up in a car beside me, a guy with a map who asked if I knew where X street was. Not a street in our area, certainly. I glanced at the map through his driver side window and could tell it wasn't a map of my city(even though he had it folded to hide the top city legend, etc.). He said, "You can get in so it'll be easier to see ..." and reached over to pop the passenger door, and I thought, "...and this is how easy it all happens, and this is how it starts for some of the women we find in creek beds and landfills." I shook my head and walked away very fast, across a neighbor's lawn and kept walking to another neighbor out mowing his yard. The guy watched me go, then sped away--but not before we got the plate number. He had a funky plate number; easy to remember. Turned out the car was stolen. 300+ miles away. I think maybe he really was sinister. And then of course there was the guy following us by car in Quincy MA in Nov. 2006. Bored? Deluded? Acquisitive? Really, really curious about my Golden Retriever? Motive uncertain, but that guy was persistent. Sheila, we share a little bit of the Deliverance thing, heaven forbid I go into one of those shops and a guy has a banjo.. I actually have a scene in Dirt Nap where my heroine holes up in a minimart bathroom...I was addressing my fears, I guess. But now Hallie's made us afraid of TAG SALES. My husband is profoundly grateful. And Jan made us afraid of $700 shoes in the last blog. My fear as a little girl was that my father would rage forth from the eyes of a Chinese dragon my mother had painted. I now hang the painting over the kitty litter box to prove my Moxie, but it's still scary. Also, in the age of tuck and duck and Air Raid Shelters, airplanes overhead terrified me--until my mother explained that it would be best to be directly under the first A bomb. Okay, I'll share a garage sale story. Years ago, when I could fit into small, cute shorts, I found just what I wanted at a garage sale, but wasn't sure about the fit. The woman said, "Oh, go on into the house and try them on. No one's home." Well, I was in the living room with no shorts on at all when I heard some male-type footsteps come bounding down the stairs. What to do? What to do? Hide behind the curtains or quickly get dressed and probably trip over the shorts in my hurry? What was he going to think if he found a stranger half-dressed in his living room? Fortunately, he walked past the living room door and went on outside. I bought the shorts and got a free scenario for a book someday. Oh, Susan D - can you hear me laughing out loud from there? I LOVE that story...only now we can ALL use it in our novels. My husband actually was once trapped in a public toilet, too, Rhys...in Switzerland with the ferry that was supposed to take us back to our hotel tooting its good-byes. No spideys, though. Or if there were he never told me about them. I was working a blood drive in a VFW in Tewksbury when I found myself trapped in a bathroom stall. I thought about climbing over the top, considering what I knew to be growing on the floor, but I know only too well what a broken bone feels like, so, I crawled under the door. My skin still crawls. Bridges. I have never been a fan, but I accidentally got stuck driving over the New River Gorge, and ever since, I have had a rather limiting phobia of them. If there are 3 lanes, I go down the middle, which really helps, and if I start to freak out, I tell myself I can drive as slowly as I want to (which isn't true on interstates, so I try to avoid them). I had cognitive therapy yrs ago for panic issues, and I should probably do it again, but I know at some point, they'll make me drive some scary bridge, and I just can't face it. Yet. So creepy about the guy with the map! Once, I was walking through an area of downtown with several vacant storefronts. It was winter, and the only person nearby was a shaggy looking blonde guy. I had already been imagining that someone could pull me into one of those stores, and the man gave me a weird feeling. So I crossed the street and hurried away from him. The next day, on the news, we saw he'd been arrested for assaulting a woman. Always pay attention to your intuition! BUMMED that I couldn't be at Redbones/Murder UnderBones..whatever that plac is called for your party. I'm sure you two rocked! !